This was what several young musicians were saying as they walked into this evening concert (More about that later!) The Sound and Music Summer School 2015 started this afternoon with around 75 budding young composers arriving at the Purcell School for a week of creating music. The students put together a very short 30 second piece of music, recorded them with our percussionist Rosie and then synced them to the film and edited the audio to add effects and resonances. Some incredible compositions came out of the icebreaker and really showed us where the bar needed to be set for this year – and wow is it going to be high! 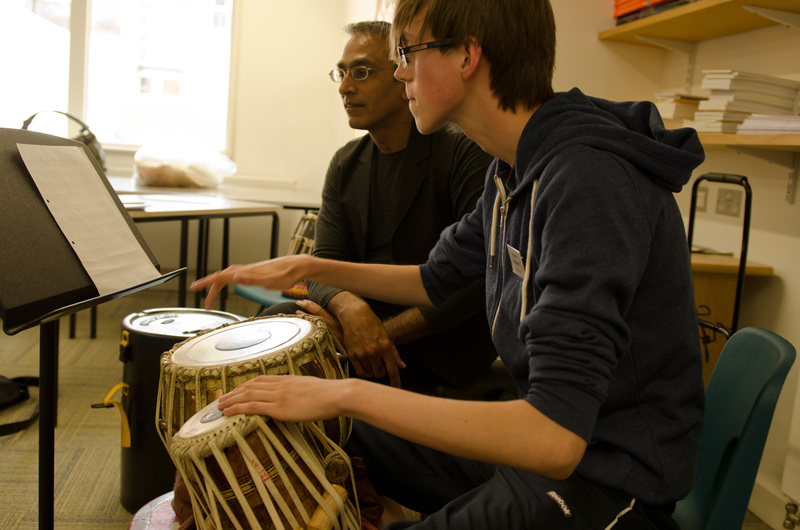 Each evening there will be a performance or workshop for everyone on the course and tonight we opened with the wonderful Tabla player Kuljit Bhamra. He has been a musician at the summer school for the last 6 years. This year he is unable to join us as he co-composed and is playing in the west end musical of Bend it Like Beckham. Instead He gave us a wonderful evenings entertainment with his band (made up of Newly appointed Royal Harpist Anne Denholm, Clarinettist Jordan Black, Marimba Player Joe Richards and Singer) Kuljit started to demystify the tabla and demonstrated many of the techniques involved, he spent time with pupils showing them how to play his instruments and several were able to have a go at playing his Tablas live in front of the audience! The group performed a fusion of Western – Indian music and even threw in a Klezmer number at the end. The group gave an incredible performance and really blew everyone away by their energy and musicianship. I certainly look forward to hearing more from everyone later this week in these evening sessions. It’s the start of what will be a very busy week and everyone is really buzzing and eager to start composing first thing tomorrow. The New Music Centre is still filled with students writing furiously on Sibelius and practising. I imagine they will be at it for a little while longer too.